When Mrs. Bear and little Sam deliver the cakes they have made for their friends in the neighborhood, Sam carries the cakes all by himself, through the snow and up to the front doors. 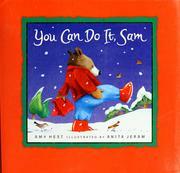 You can do it, Sam / by Amy Hest; illustrated by Anita Jeram. 100 ME:PersonalName $a Personal name Hest, Amy. $c Statement of responsibility by Amy Hest; illustrated by Anita Jeram. 520 Summary $a Summary, etc. note When Mrs. Bear and little Sam deliver the cakes they have made for their friends in the neighborhood, Sam carries the cakes all by himself, through the snow and up to the front doors. 650 Subj:Topic $a Topical term Self-confidence -- Juvenile fiction. 650 Subj:Topic $a Topical term Mother and child -- Juvenile fiction. 650 Subj:Topic $a Topical term Cake -- Juvenile fiction. 650 Subj:Topic $a Topical term Bears -- Juvenile fiction.